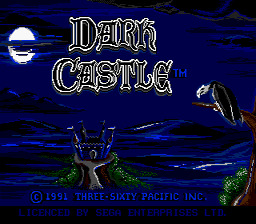 Move over Donkey Kong, here comes Dark Castle, a game with similar gameplay but with little twists. If you can climb stairs, climb ladders, or climb ropes (man, that's a lot of climbing) then you can play this game with the greatest of ease. Although you will have to dodge rocks thrown by a big guy on a platform and throw knives at little flying eyeballs, not to mention jumping back and forth from moving platforms. The graphics for this game aren't the best that we have seen from Sega Genesis, and the music is somewhat wanting, however this game is still fun to play. So if you can play Donkey Kong then look at this game as an upgrade. This game plays much like Donkey Kong in the fact that you're climbing from one level to the next, to get to the next board. But don't worry, those of you who are afraid of giant monkeys (even though you killed King Kong in box office sales) this game doesn't have the infamous orangutan, instead there is a guy in black underwear and an executioner's mask throwing rocks at you. Run through all the levels to rescue the Princess. Good luck, man, you'll need it. No upgrades, no power-ups, it's just you against the world.